Dedicated to former hatchery Superintendent Gerry Wade. The Casco (Wade) State Fish Hatchery was established in 1954. In 1960, new 8' wide raceway sections were constructed and the hatchery building was added in 1962. In 1979, ultraviolet water treatment equipment was installed. The most recent facility upgrades were in 2004 when a bulk oxygenation system was added and then in 2005 when an effluent microscreen filtration with clarifier and solids storage was made operational. Water for the facility is supplied by Pleasant Lake from a dual intake system and is gravity-fed to 32 covered concrete raceway sections. Species reared at the Casco facility include brown trout, rainbow trout, landlocked salmon, and brook trout (seasonally). The Department obtains salmon eggs by using a fish trap on the Jordan River to capture spawning landlocked salmon that are returning from Sebago Lake. 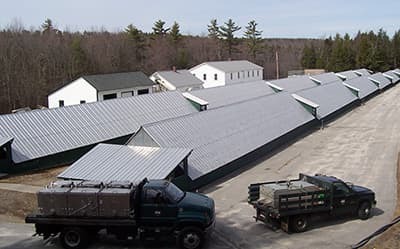 The hatchery in Casco is the sole supplier of rainbow trout and the Sebago strain of landlocked salmon for statewide stocking programs.